KIGALI, RWANDA—One of the first things you will likely notice if you have the chance to visit Kigali, the capital of Rwanda, is the extraordinary cleanliness that spans the city. This pleasant reality can be explained by looking closely at how the Rwandese manage their environment. Of particular importance is their stance on plastics: Rwanda is now entering its fourth year with a nation-wide law banning all plastic bags. As Canada continues to debate the future role of plastic bags, it is worth looking at the Rwandan example, and understanding how such an initiative operates, and what benefits it can bring. Toronto is the only Canadian city with a mandatory fee to the consumer of five cents per bag. However, in recent months Toronto mayor Rob Ford has repeatedly attacked the fee, and has explicitly stated that he wishes to get rid of it. Why you may ask? The answer: consumers are apparently annoyed. It seems that Mayor Ford may be ignoring the facts, as multiple reports have indicated that the tax has greatly reduced the purchase of plastic bags in Canada. For example, Metro grocery stores have reported a drop of 80 per cent since 2009. 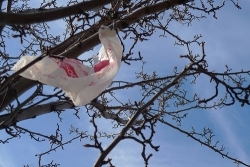 This reduction in plastic bag use is important for the Canadian environment, says Franz Hartmann, Executive Director of the Toronto Environmental Alliance. Although the fee is playing a positive role, it is worth looking past initiatives that simply aim to reduce use and toward those that target outright elimination. The perfect case study is the fight against plastic bags in Rwanda, a fight that has led to their complete demise. For anyone who has travelled in Africa the ubiquitous nature of plastic bags sprawled everywhere is an undeniable reality. The problem has not gone unnoticed though: several African countries have been working to ban plastic bags for years. Located in Eastern Africa, Rwanda is largely known for its tragic genocide that exploded in April 1994. Since then it has tended to operate as a relatively unknown country outside certain political and economic circles. However, for such a small, developing nation it is home to a variety of unique, forward thinking policies. In 2008, Rwanda declared a nation-wide ban on all plastic bags. The initiative was a response to the two most common ailments caused by plastic: a well documented understanding of plastic's negative environmental impacts, but equally influential, the extensive physical presence of bags around the country. Dr. Rose Mukankomje, the Director General of the Rwanda Environmental Authority (REMA), has been at the forefront of this policy, and continues to work on a daily basis to monitor its progress. In addition to the visual pollution, research from the National University of Rwanda reported the widespread environmental consequences of plastic. “Plastic was not only all over the ground, but underneath as well. This hindered agricultural production in Rwanda, as plants cannot grow past the plastic. As well, our water sources were becoming highly polluted with plastic being found inside many dead fish,” Dr. Mukankomje recalls. The first step was raising awareness about this information. This began in 2005 during the national day of cleaning, called Umuganda . As the communities around Rwanda began to clean up they were asked to collect all the plastic they could find. “We came up with a huge, huge amount of plastic—in the land, around our compounds, everywhere—everyone was scared,” says Dr. Mukankomje. This event signaled the turning point. It not only sensitized many Rwandans to the problem of plastic within the country, but it got politicians thinking about the issue as well—President Paul Kagame took part in this event. A nation-wide campaign began by flooding the media. Furthermore, local NGOs and businesses were commissioned to create alternatives—mainly cotton or banana leaf bags. The benefits of Rwanda’s plastic bag ban were quickly evident: in 2008 UN Habitat named Kigali the cleanest city in all of Africa. Now three years since the bill was passed, Rwanda remains a plastic bag-free country, and has developed a reputation across the region for its extreme cleanliness. The passing of the bill coupled with Rwanda’s monthly day of cleaning has insured that it remains this way, and will continue for the foreseeable future. As Toronto debates the future of plastic bags, the story of Rwanda, now more than ever, should be considered. Though different in many fundamental ways, Canada, like Rwanda, relies greatly on its natural resources. Thus, the future health of the land is of pivotal importance in both countries. Ryan Kohls is a freelance journalist out of Peterborough, Ontario. Submitted by Douglas Lober (not verified) on Fri, 2011-06-10 11:21. Canada has always been a role model and taking this step is huge in showing the world that we can all live without plastic bags. In all reality they weren't a big thing until the early 80's anyways. Most of us can remember those days and in all reality stopping using a plastic bag and bringing your own bag is about as easy as remembering to brush your teeth. we applaud Canada and Rwanda for that matter. Submitted by Anonymous (not verified) on Sat, 2011-06-11 18:04. I am from Rwanda and I am very happy to read this article. I have seen the change from a dirty filth town in 1994 to a very clean city without any plastic at all. I used to go shopping and shops would give me about 4 plastic bags at a time, one for every item bought; a kg of sugar, a piece of soap, a tin of margarine etc. These days there are a variety cotton cloth material bags and paper bags that we use for shopping and it is very pleasant to do so. Recently I was out of Rwanda and I saw plastic paper bags and it was like seeing any dirty you can imagine on a street. Sure, change starts with our heart/conviction that it is possible and they are as many alternatives solutions as you may want to find. Submitted by Dennis (not verified) on Thu, 2011-06-16 20:07. I am from Edmonton where we recycle 90% of everything. Most of the people I know use the cloth bags when going for groceries etc. Most stores give them to customers who spend more than $40.00 or a person can buy them for a few dollars. It seems the well made ones last forever compared to plastic. One of the "really big" food stores started charging for the plastic bags a very long time ago. The other "really big" store still has plastic bags that fall apart. Good article that I will share with all 72 Facebook friends.